Finance Department – Comprehensive Financial Management System (CFMS) – Human Resources Management under CFMS - Issue of Health Cards to State Government Employees – Online Collection of Employees’ data through Web-based application for implementation of HRMS Module and issue of Health Cards –Instructions to furnish the Data – Orders – Issued. 1. The DDOs have to login to the website “https://fdp.cgg.gov.in” by using their existing log-in ID (DDO code) issued by the Director of Treasuries and Accounts (DTA) using the default password “dataentry”. 2. After the first login the DDO has to change the password and set a new password. The system has been designed to provide for change of password by the DDOs. They may remember the password and should not disclose to anyone to maintain integrity in dataentry. The DDOs will be held responsible for any errors in dataentry if any passwords are misused or the data is entered without the knowledge of the DDOs. 3. After setting the new password, the DDO has to first enter the details of his own office and the details of the subordinate offices if any and also the details of the next higher office to which the unit office in which the DDO works will report. He has to complete this within 3 working days, in any case not later than 24.12.2013. 4. After finishing the entry of the above data, the DDO has to go through the user manual available on the website for a better understanding of all the fields of different screens intended to capture the data of different categories of employees. 6. The DDO has to verify the details furnished by the employee with the entries available in the Service Register of the employee and authenticate the data to be uploaded. He should countersign each form submitted by the employee before the commencement of the dataentry. 7. After completion of the dataentry the DDO has to take a printout through the application and countersign it duly verifying with the forms submitted by the individuals. These copies may be given to the individual for confirmation. If any discrepancy is pointed out by the individual after due verification with the records necessary corrections may be made any time before the data is finally submitted to the Finance Department. After the data is finally confirmed by the individual his signature may be obtained on the printout. The DDO may counter sign and send a copy of this to the Treasury Officer/PAO along with the pay bill. 8. The DDO has to prepare a list of all employees under different categories and ensure that relevant forms are supplied to the employees under acknowledgement and ensure that the data of all employees is uploaded. For this purpose he has to prepare a checklist containing the names, the dates on which forms were given, the dates on which forms were returned, the date of countersignature, the date of dataentry, the date of countersignature of the printout after completion of the dataentry of each employee and the date on which copy of the countersigned forms submitted by the employee and countersigned hard copies of the data entered are sent to the Treasury Officer / PAO. sir, I am very happy to see your website in the teachersbadi.co.in. It is verymuch useful to the teachers and Govt. employees working in the state. At the same time this information regarding g.o. 's were so useful to employment seeking personals.. Note: Sir, Pl. mail to me any latest G.O.'s. etc.if possible. 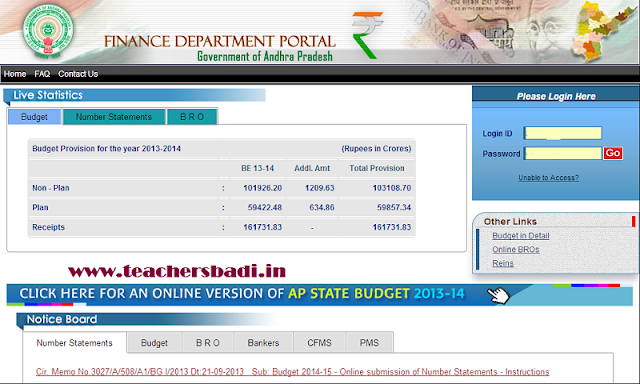 can i do modification in employee details and dependent details in finance department portal ? This request is blocked by the SonicWALL Gateway Anti-Virus Service. Name: AutoRun.DTBV_2 (Worm)"